In another bowl combine the pumpkin, milk, oil and eggs until the mixture is smooth. Fold pumpkin mixture into the flour mixture. Fold in chocolate chips & nuts. Do not over-mix. Divide batter between muffin cups and bake for 20-25 minutes. 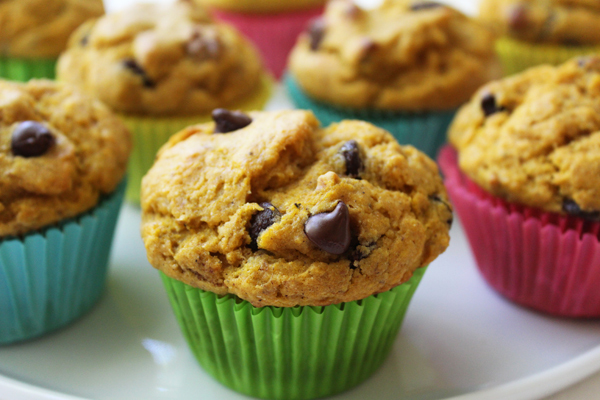 21 Comments on "Pumpkin Chocolate Chip Muffins"
Your recipes are wonderful! .I used sweet potato that I baked and mashed and it turned out great. Or you can use canned sweet potato or canned pumpkin . I found that the pumpkin and sweet potato are interchangeable. Like sweet potato pie or pumpkin pie. Try it. You might like it. Can I substitute almond or soy milk for the cow’s milk? I can’t say because I have only made them with low fat cow’s milk but if you have baked with almond and soy milk before it’s probably worth trying. You can use almond milk. I use it all the time. Hi Jenny, My neighbour just gave me a few huge zucchini. Do you have a zucchini loaf recipe? What is 1%milk? Can i use ordinary fresh milk or evaporated milk? You can use whole milk but I would not recommend evaporated milk because it’s so heavy. (1% milk is low fat milk that has 1% fat content but whole milk is around 3% so you can use that as well). Thanks jenny for the reply. I tried your recipe the result is not as lovely as yours in the picture. The muffin sticks on the muffin cups. What do you think is the problem. Muffins sticking to the paper liners is a common problem. The solution would be to not use paper liners and just grease the pan, making sure you grease the cups and the top around each rim. Sometimes I can find foil-lined paper cups, which are great but I can’t always find them. Besides the sticking, I hope the muffins tasted good. Instead of using muffin cups, I just use parchment paper. If you cut a square out of the parchment paper and press it to the bottom of muffin pan, it takes the shape of the muffin pan. If it does not want to stay, you can either make the muffin pan a bit wet or use oil. I use water, as I don’t have to wash the pan after! I will submit a photo soon! You can use parchment paper muffin liners, works like a charm! There’s no whole grain pastry flour around me. What do I replace with. You can make these muffins entirely using all purpose flour. I made these with leftover frozen pumpkin (thawed and drained) that I cooked from a real pumpkin and just added a quarter cup of truvia (instead of the canned pumpkin) and they turned out super delicious!!!! I can’t find here where I live canned pumpkin how much of the fresh pumpkin can I use? thank you. I also have a problem cutting up a whole pumpkin so I just cut it in half, deseed it and then roast it until all cooked, let it cool and then peel off the skin and mash. We dont have canned pumpkin here in oz so this was my solution.